During my first day as a solutionary, I drifted into a conversation among my program leaders about the “side yard wish list.” Simply put, this is all the stuff they wanted to put in the grassy space next to our house. There was mention of chicken coops, bike racks, 3-bin compost systems, tool sheds, and rain barrels. I took one look at the side of the house and chuckled. This would be like when my parents talk about fixing their garbage disposal— it sounds like a great idea, but they never quite get it done. 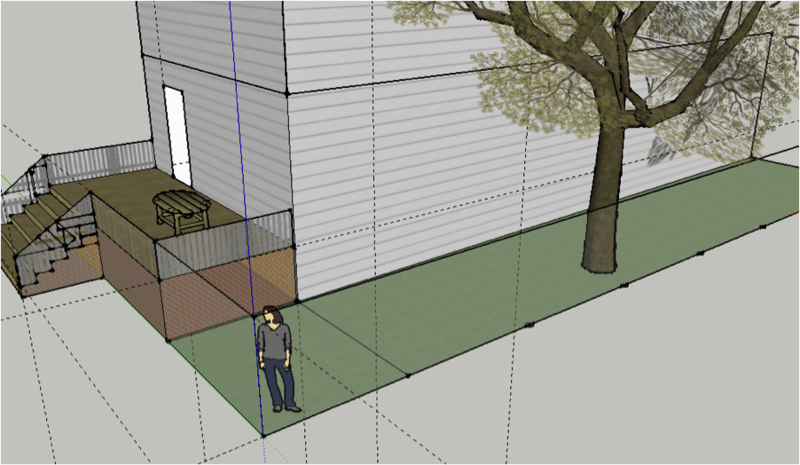 Little did I know, a week later I would be drafting a floor plan of this infamous side yard and submitting it to a carpenter, who will complete the project next week thanks to a group of volunteers. In addition to fitting all of the “wish list” items into the yard, we will be adding a rain garden, demolishing 2 flights of stairs, and extending the space an additional 8 feet. This project fits into the Eco Home project area of the Chicago Summer of Solutions (a.k.a. LETS GO Chicago), which aims to transform a church-owned, single-family home into a demonstration site for sustainable urban living. As I type this post, several of our team members are attending a free workshop to learn how to set up a plan to retrofit our house and get it certified under the Chicago Green Homes Program. The side yard is just one of many changes we are learning about and implementing at the house this summer as we prepare to conduct outreach around sustainable living. While we are still in the planning stages of our renovation, I have learned that things move fast at LETS GO Chicago if you are willing to make a solution the priority. With a little bit of planning, research, and a willingness to try, our ideas are very capable of becoming reality. Stay tuned for future posts from the Eco Home on indoor aquaponics, home weatherization, worm composting, and more!